Following on from the popularity of last year’s brewery tours we are delighted to announce this year’s Summer Series. Join us on Friday evenings throughout the summer when we will host a ninety minute session including a brewery tour, tasting and food pairings. These relaxed, informal events were very popular in 2014 and this years sessions are soon to fill up quickly. Sessions include a look at the brewing equipment, a talk on the brewing process and the ingredients we use as well as a tutored beer tasting. Tastings will be done with one of our certified Beer Sommeliers and food pairings including the award winning Brewer’s Gold cheese from The Little Milk Company will be on offer. As we are a working micro brewery our tours are ‘on the ground’; you get to meet and talk with the brewers and others who are hands-on in the brewery and have a thorough knowledge of beer and brewing. 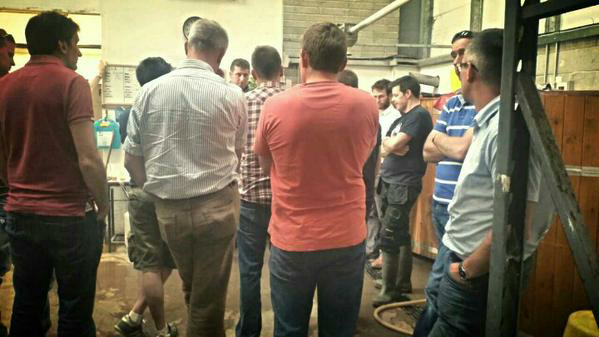 Visitors on last year’s brewery tours included Cork blogger Billy Lyons who wrote about his tour on his blog, which you can read here. Sessions will begin at 5pm, running on the following Fridays: July 10th*, 17th, 24th and August 7th, 14th 21st. Entry fee is €10 per person. Group sizes will be limited, so advance booking is necessary. Bookings can be made online via our webshop, or get in touch with us either by email, on Twitter or on Facebook for more enquiries or to make your booking. If you would like to do a brewery visit outside of these times please contact the brewery and we will do our best to accommodate you. Be aware, though, that summer is our busiest time both for production and events so we may not be able to meet all requests.